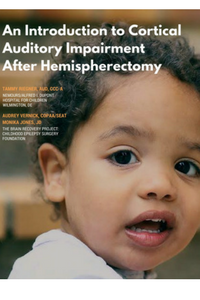 To learn more about hearing after hemispherectomy, download our 15-page guide here. It provides an in-depth review of the various hearing and listening challenges after hemispherectomy, as well as assessment guidelines and possible treatment interventions. For parents, auditory clinicians, educators. After any of the various hemispherectomy procedures, hearing is preserved but the ability to listen in various situations can be dramatically affected. Here we explore how the brain processes sound after surgery and how the procedure can affect the child’s ability to listen in various environments. What is hearing and listening? Auditory function is broadly described as the ability to hear and listen. Hearing is a passive sensory process where a person detects sound. Generally, a person does not have to try to hear something. Listening, however, is an active process involving detection and interpretation. A person must actively attend to and discriminate different sounds, particularly speech. The ability to hear and listen provides us with an enormous source of information and forms a bridge between the world and how we interact with it. In school, hearing and listening allow a child to maintain a high level of concentration with little effort, communicate effectively with instructors, and register information accurately. In social situations, listening allows us to participate in conversations and interact with others in both loud and quiet settings. Most children after hemispherectomy will pass a typical pure tone hearing test (given while the child is wearing ear phones so that information can be assessed for each ear) because the auditory cortex in the single temporal lobe of the remaining hemisphere of the brain can assess the single tone given separately in each ear during the test; however, when this single temporal lobe is required to process sounds coming into both ears at the same time, problems arise. Many children struggle with central auditory processing disorder, hyperacusis, or misophonia. Central auditory processing disorder, a type of cortical auditory impairment, is a condition where the brain is unable to process incoming words or sounds properly. A child with central auditory processing disorder may be easily distracted or unusually bothered by loud or sudden noises, gets upset in noisy environments, has difficulty following directions, struggles with abstract information such as math word problems, or has difficulty following conversations. 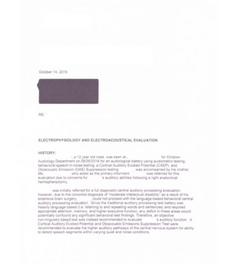 Research shows that children after hemispherectomy will do well on the “sound in quiet” portion of the Hearing In Noise Test (where they listen to different environmental sounds and words, without ear phones, in a sound-proof booth); however, when there is competing noise from the environment (“sound in noise”) or environmental sounds or words coming into both ears at the same time, hearing and listening are impaired. Dichotic listening is the ability of the brain to understand different words or sounds coming into each ear at the same time. Research shows that after hemispherectomy, the ear opposite the removed hemisphere is extinguished during dichotic listening tasks. Regardless of right v. left hemispherectomy, recognizing words in noise is impaired. In addition, after left hemispherectomy, recognizing filtered words (distorting the word sounds) is often impaired as well. Sound localization is the brain’s ability to recognize where sounds are coming from. After hemispherectomy, this ability can be greatly impaired. One study found that adults who had hemispherectomy in childhood were completely unable to perceive auditory motion. A child may be trying to follow a speech therapist’s intervention during a group speech session with other children making noise in the room. This process is often challenging, even for persons with normal hearing and cognitive abilities; but, for a child with physical, visual, and cognitive challenges, this can be overwhelming. Because a child after hemispherectomy typically has good auditory recognition of spoken words in a quiet environment, a quiet educational environment is recommended during times of academic instruction. 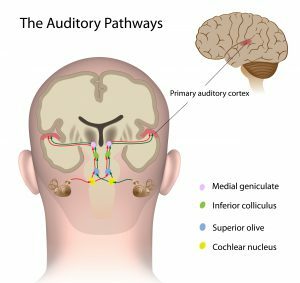 Because a child after hemispherectomy or similar surgeries usually seems to hear just fine, and typically passes a pure tone hearing test, central auditory challenges can go unnoticed. This can be problematic on many levels. One particularly dangerous situation is where a child may be unable to localize sound properly – when they attempt to cross the street and cannot hear the direction an approaching vehicle is coming from, coupled with the visual impairment, there is a serious risk of injury. When learning to read, the child may be unable to associate the appropriate sounds a letter makes, making phonemic awareness and phonological awareness difficult to learn. and to read a significant challenge, or they might be trying to learn in a classroom with too much noise for them to be able to properly interpret the information given by the teacher. For these reasons, it is imperative that a child after hemispherectomy have a central auditory evaluation. 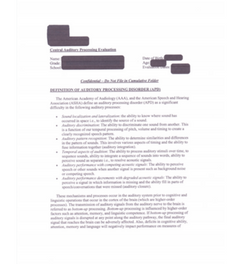 You can learn more about central auditory evaluations on the American Speech-Language-Hearing Association’s website here and in our guide below. Hyperacusis is an extreme sensitivity to certain frequencies or volume ranges of sounds. Anecdotally, many parents report that their child is hyper-sensitive to loud noises such as dogs barking, fire engine sirens, and books slamming onto the floor. Although case reports are absent in the research literature, anecdotal reports from parents establish that many children are hypersensitive to certain common environmental sounds after hemispherectomy surgery. Sounds of rustling papers, squeaky doors, or the hum of an air conditioner may be problematic for the remaining half of the brain to process, causing the child distress. Hearing and listening after hemispherectomy can be a challenge, this guide helps parents understand cortical auditory impairment after hemispherectomy. Curious about dichotic listening? Wear headphones (not ear buds) and listening to this video. You’ll probably hear the words in the right ear more clearly or before you hear the word spoken into the left ear. Why? It’s because most people are left lateralized for language, so because the word in the right ear gets to the left temporal lobe faster than a word spoken into the left ear, you hear the word in the right ear first. The following are actual assessments of children after epilepsy surgery. 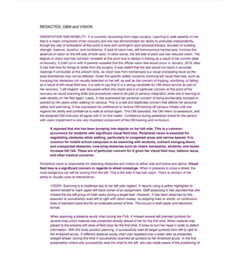 We provide these as an example of what a good evaluation will include.